Content is one of the key elements of any Account Based Marketing (ABM) strategy. Marketers utilize a variety of content formats, such as emailers, case studies, and reports, to engage stakeholders within target accounts. According to Hubspot, 82% of prospects prefer content that’s relevant to the industry they work in. However, the sad state of affairs is that more than 50% of organizations have limited or no ability to gather real-time intelligence on target accounts according to a study by Dun & Bradstreet. A robust marketing strategy that aims at leveraging every opportunity to build, scale, and sustain, depends on intensive research and real time-tracking. Market intelligence is this catalyst that fuels an ABM program with the right insights and relevant information about the people behind your target accounts. Armed with these granular facts, it informs you about the ideal next steps and helps you plan an effective content strategy to nurture customer relationships at every stage of the sales cycle. With the stakes being higher every time a prospect accesses your content, market intelligence helps you rise to the moment with quality and tailored pieces that address their needs. Next, tap into market intelligence to draw out information about the firmographics (number of employees, industry, annual revenue, location etc.) 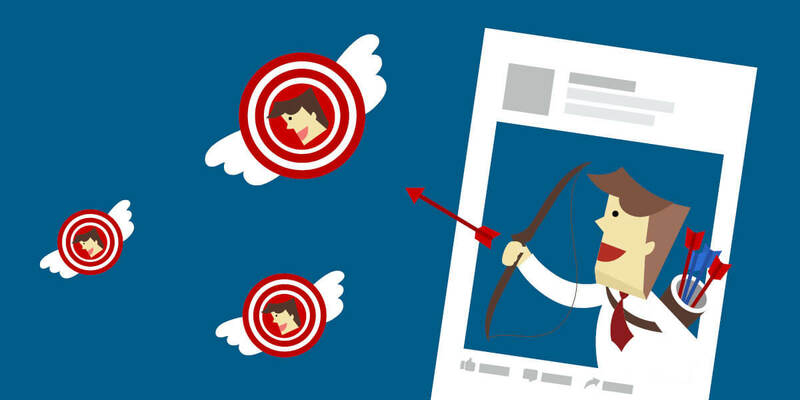 of your target accounts across verticals. It is a common practice among B2B marketers to distill their existing content into snackable pieces like informative whitepapers, infographics for top-of-funnel awareness, and engaging social media posts that can be seamlessly integrated into the buying stage communication. In order to see returns on your market intelligence efforts, you need to effectively leverage the insights gathered. Explore ways to use them in every sales interaction. While each content collateral you use in a normal sales pitch or marketing program is still worthwhile, what drives home value is your ability to target it to the relevant account. A research report by the Information Technology Services Marketing Association (ITSMA) states that 75% of executives will read unsolicited marketing materials containing ideas that might be relevant to their business. 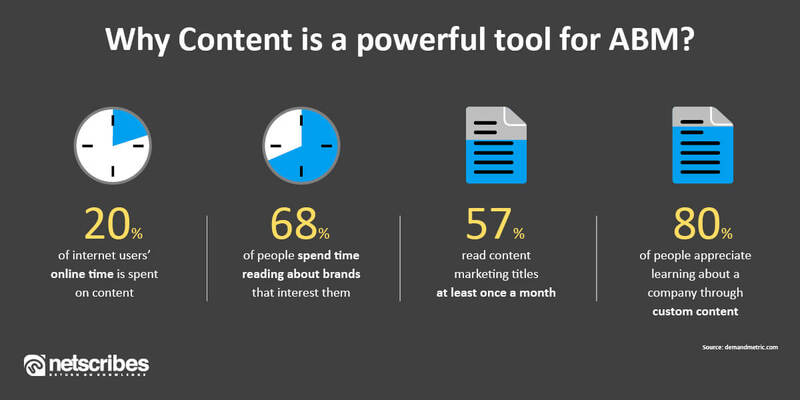 Hence, it’s important to be attuned to the kind of content collateral your target accounts are inclined to consume – be it emails, podcasts, interactive content, success stories, eBooks, case studies, web pages, research reports, slide shares, webinars, white papers, surveys, blog posts, videos etc. ‘Land and expand’ is a well-known model of Account-Based Marketing. It simply means that after a new customer signs up, the sales team must take the relationship to the next level by helping the customer see value in the company’s entire set of offerings and map them to the latter’s needs accordingly. Since Account Based Marketing delivers customized communication addressing individual pain points and needs, thus deepening the relationship, it helps marketers effectively broaden the funnel and multiply revenue streams. Often, companies have certain service packages or product add-ons that are relevant only to a specific department. Using research-backed knowledge you can now address each department individually at every opportunity without going back to the drawing board. According to Marketing Profs, 60% of marketers say personalizing messages based on consumer behavior is their top challenge. Personalization requires you to speak to the realities of the industry. Content that caters to your prospects routine needs is far more effective than a piece that requires them to imagine how your offering would help resolve their specific challenges. Think of it as a content pyramid, with the initial content piece addressing a broad market. As you work up the levels, tailor and tweak your content to make it relevant to your Ideal Customer Profiles (ICP). You can even whip up exclusive reports for your key accounts focusing on their company-specific needs, by arming your resources with fact-rich market insights. Employing the email or direct mail route works incredibly well for such content. While Account Based Marketing endows you with great customization abilities, it is important to do it all within the borders of compliance. The best way to approach this is to treat your prospects the way you as a company would like to be treated. Hence, partnering with a research provider who is updated on the best practices in this realm is essential. Netscribes is a market intelligence and research provider, empowering global firms with account-based insights and customized content aimed at elevating their marketing effectiveness. To find out more about how you can achieve better marketing results, contact [email protected].